You know how the story goes: dear little Harry with the lightning scar and the goofy glasses is forced to live in the cupboard under the stairs by his horrible Aunt and Uncle. Then good old Dumbledore turns up with a wand that can put out street lights and some sage advice for our Harry, catch the Hogwarts express from King’s Cross – platform 9 ¾ . Of course when Harry arrives at King’s Cross there’s no such platform, just a brick wall between Platforms 9 and 10. He waits and watches and finally he sees the most remarkable thing, wizard folk walking through said wall onto the hidden platform. 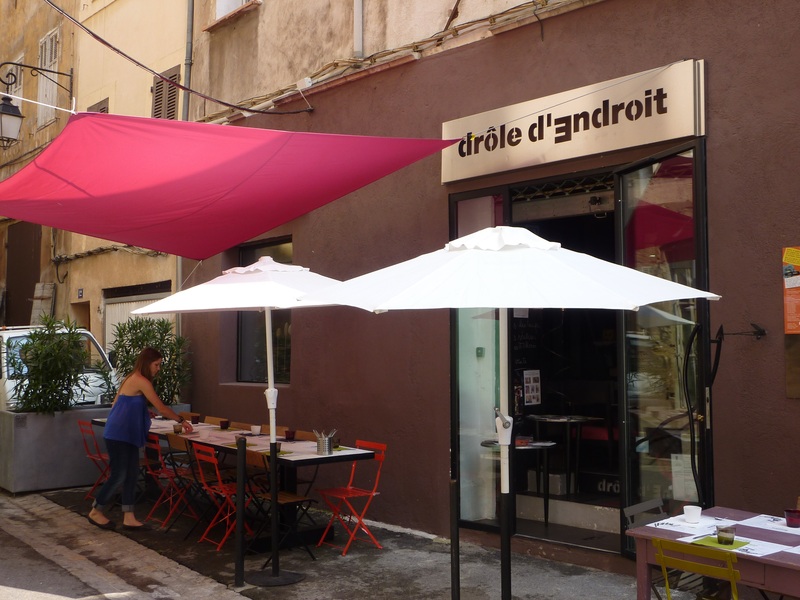 Now every author has to get his/her inspiration from somewhere and it’s my theory that JK must have once paid a visit to Drole d’Endroit in Aix. Admittedly you don’t have to walk through a wall to get to the restaurant, but the first entrance passageway, a gap between two buildings next to a knife shop, is so narrow that the illusion of doing so is created. There should be a health and safety warning directing obese people further up the road because eventually some replete diner is going to get wedged between the air conditioning units and will have to be pulled free by the pompiers. The alleyway eventually gives onto a secret courtyard area that houses the Drole D’Endroit and a discreet door for the Aix Sauna Club. The interior of Drole D’Endroit (literal translation funny place) features a mad array of colour and artefacts. Brash paintings from one of the rotating list of exhibiting artists fill the wall, metal objet d’art spiral and coil from the ceiling. There’s a violent red sofa, mixed with purple comfort chairs and utilitarian metal tables. 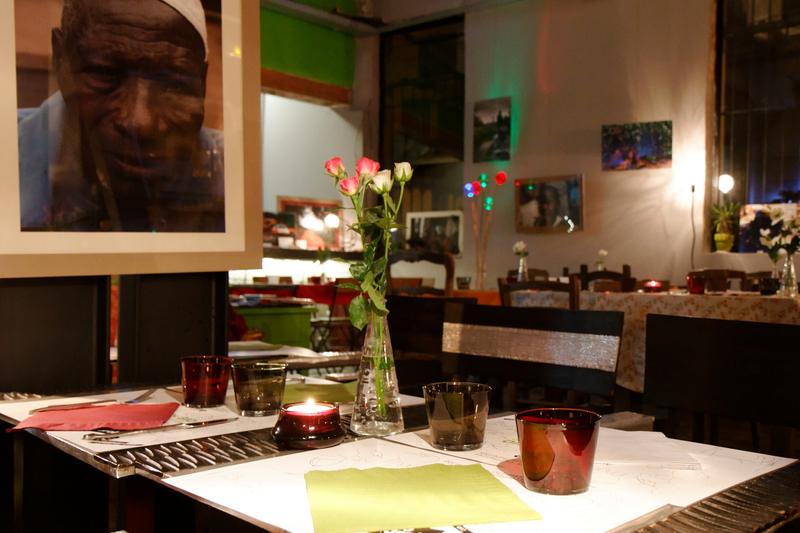 In Boho Paris, or Soho London, this type of artistic , out there, mish mash of culture, material and taste, would not look out of place, but in ultra BCBG (bonne chic bonnes genes) Aix it feels like a wonderfully refreshing two fingers stuck up at the establishment. Eating elsewhere in the city can be a debilitating experience. At times it seems that everything that is wrong with French society has been condensed into the food in the city’s restaurants which tends to be stagnant, unimaginative and overpriced. Walking up the Cours Mirabeau it is hard to credit that a nation frequently cited as the home of gastronomy has been reduced to such a level. Bar after bar, imitation brasserie after imitation brasserie, offers little more than the ubiquitous steak frites, a dish that lines the bottom of the owner’s pocket rather better than the inside of the customer’s stomach. Even the grand old dame of Aix dining, Les Deux Garcons, is more set-up for people watching than pleasing the stomach. The table cloths are white, the waiters wear penguin suits but the one thing that separates Les Deux Garcon from the Parisian brasseries it seeks to imitate is the lack of competition and resultant consistently good food. Back in the wizard world at the Drole D’Endroit things are rather different. The menu changes daily and is written on a blackboard which is wheeled around the restaurant. Prices are competitive (around 12 euros for a main), as they have to be given the location, and the menu creative and broad. Favourites such as the citrus braised pork cheek run out quickly leaving dishes that might challenge the more squeamish – carpaccio de tete de veau is apparently Voldermort’s regular order. We ate a goat’s cheese and chorizo salad as a starter. There was plenty to share for two people, and enough for one for a main. 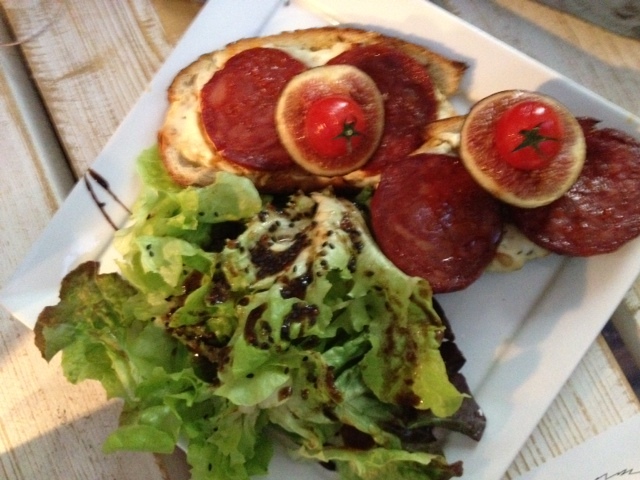 The chorizo was thickly sliced oily and piquant, the goat’s cheese pleasingly fondant, melting into the salad of wild leaves. For mains I had cod, rolled onto a stick and gently spiced, served on a bed of ratatouille and couscous, my companion salmon with wild rice. Both were well cooked, with the salmon charred on the outside but succulent within. For wine, there was an excellent Touraine Sauvignon, priced at 20 euros a bottle, it had the acidity and fullness of flavour of a Sancerre. Pudding was a good but unremarkable chocolat fondant, which the rest of the diners avoided in favour of the gourmet coffee, a collection of coffee desserts. Looking around the room there was not a po-faced femme d’avocat in sight. A stroke of luck for any of the city’s lawyers who happened to be passing their lunchtime in the Sauna club next door. Instead the clientele was an eclectic crowd of young and old, artistic types, Guardian rather than Times readers. We booked on Friday morning and got one of the last tables for lunch. 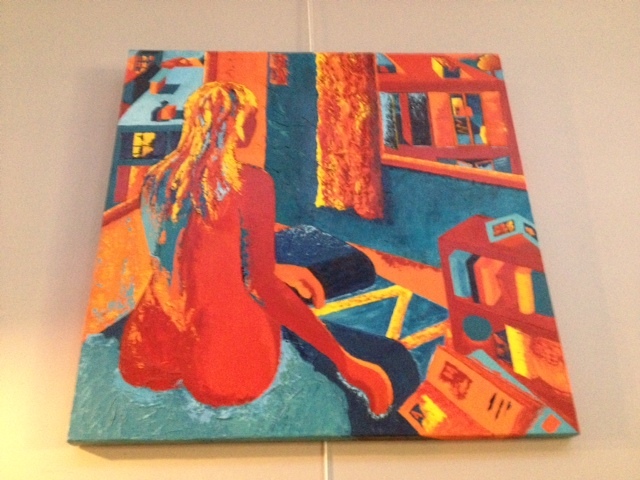 The Drole d’Endroit hosts musical evenings, and as already mentioned showcases the art of a rotating group of painters. There’s a warm honest spirit about the place, it’s the type of restaurant one might lie in bed and dream of setting up, somewhere that’s quirky, fun and above all happy. Unfortunately what usually happens to such dreams is that they get crushed by the realities of the modern world and the punitive rental rates which drive the quality of the food down to the steak frite lowest common denominator level. Drole d’Endroit has survived and prospered not in spite of its location but because of it. The end of a smelly passageway in which it feels that you are more likely to get mugged rather than find some food, is indeed a funny (and no doubt cheap) place to open a restaurant. Visit, it will make you smile.